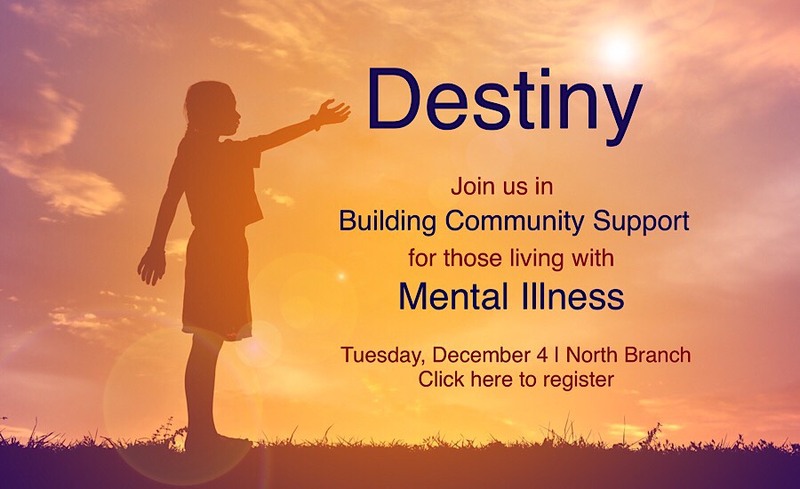 Our Destiny – December 4 – Join us! LIKE & SHARE. Please Join Us! Everyone is welcome. You can make a difference! Healing cannot take place alone. We are building a community where families and individuals living with a mental illness feel welcomed and supported. On November 19th we discussed desired outcomes that are ‘provocative’, stretching the norms, yet grounded in designing a supportive system with our community members at the forefront. In our next conversation, explore with us how to challenge systems to successfully fulfill individuals mental health needs in our communities. Help us build our dream, the design of our destiny and how it will work toward supporting “Mental Wellness” in attitudes, relationships, and organizations. Help us implement big and bold possibilities of more valuable and vital futures in our communities. Join us. You are the difference. The Community Conversations are a sequential, progressive set of sessions as listed above, each moving forward and building from the previous one. You are encouraged to attend all four conversations, however, it is not mandatory. Please attend when you are able. Any and all participation and your input in this process is valuable.